Sherine Gabriel, M.D., is now head of the medical school at Rutgers University. Many factors associated with arthritis likely play a role in increasing heart disease risk. Some rheumatoid arthritis medicines such as steroids can promote high blood pressure, diabetes and hardening of the arteries. Anti-inflammatory drugs like naproxen and ibuprofen can affect kidney function and blood pressure. In addition, because rheumatoid arthritis can limit mobility and make physical activity painful, patients tend to have higher rates of high blood pressure, elevated lipid levels and excess weight. People with rheumatoid arthritis are less likely to have the typical signs and symptoms of heart disease. As a result, heart disease often goes unrecognized and untreated in its early stages, delaying treatment and increasing health risks. Traditional cardiovascular risk factors seem to impact people with rheumatoid arthritis differently. The standard physician-recommended treatment for patients at risk of cardiovascular disease is to lower lipid levels and control weight. For people with rheumatoid arthritis, however, the opposite may be recommended. Lower lipid levels and weight loss in someone with rheumatoid arthritis can actually spur more severe systemic inflammation, in turn raising the risk of coronary artery disease. “It’s a complete paradox,” Dr. Matteson acknowledges. According to Dr. Gabriel, the challenge is to identify which patients with rheumatic conditions are most likely to develop cardiac disease, before symptoms appear. Mayo Clinic is meeting this challenge on the research and clinical fronts. Research teams are exploring better imaging techniques, blood tests and risk assessments. And Mayo Clinic’s Cardio-Rheumatology Clinic provides care tailored to people with rheumatic conditions. Standard echocardiograms can show heart problems once they exist, but they aren’t that helpful at detecting early disease at a time when physicians could potentially do something about it, Dr. Gabriel says. A groundbreaking Mayo Clinic study found that a special kind of echocardiogram holds promise for early detection of heart disease in rheumatoid arthritis patients. In the study, myocardial strain imaging using a type of ultrasound called speckle-tracking echocardiography identified a pattern of heart muscle damage unique to people with rheumatoid arthritis. Myocardial strain is a measure of how the heart muscle functions when it contracts and relaxes to pump blood. The study used the resources of the Rochester Epidemiology Project. It was the largest study to evaluate myocardial strain characteristics of rheumatoid arthritis patients without known cardiovascular disease. In addition, it was the first study to look at right ventricle strain. Speckle-tracking echocardiography holds great promise, and in the future could be used to show heart disease before patients have clinical signs, Dr. Gabriel says. In another recent study, Mayo Clinic immunologists exposed white blood cells from people with and without rheumatoid arthritis to various substances that stimulate inflammation. The results showed a unique immune response signature associated with advanced heart muscle dysfunction in people with rheumatoid arthritis. Immunologists hope this information will help them create a blood test that predicts which people with rheumatoid arthritis are at highest risk of cardiovascular disease. Cardiovascular risk assessments use basic medical history and lifestyle information to predict a person’s five-year risk of developing cardiovascular disease. Physicians use risk scores to guide preventive care and treatment recommendations. Mayo Clinic research shows that standard cardiovascular risk assessments often underestimate the danger faced by rheumatoid arthritis patients. Although inflammation plays a key role in the increased cardiovascular risk associated with rheumatoid arthritis, many risk assessment tools do not factor it in. Likewise, rheumatoid arthritis medication use is not part of a standard risk assessment. 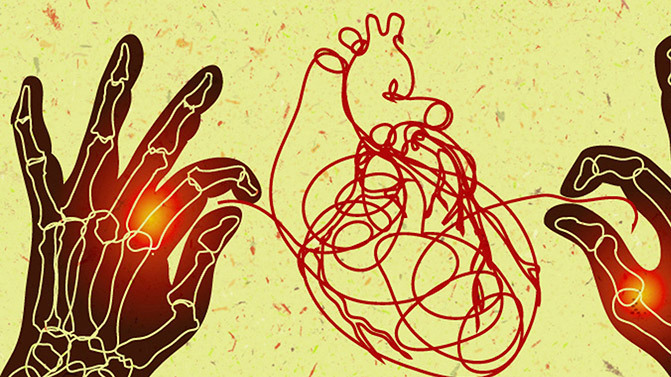 As a result, traditional risk scores may give people with rheumatoid arthritis a false sense of security about their heart disease risks and result in missed opportunities for preventive measures. Translating research into clinical practice is paramount at Mayo Clinic. To that end, the divisions of cardiovascular diseases and rheumatology have joined forces to change the clinical approach to rheumatic conditions. The Cardio-Rheumatology Clinic at Mayo Clinic opened in Rochester in the summer of 2013. The clinic provides specialized care focused on early detection, prevention and treatment of cardiovascular disease in patients with rheumatic conditions. “We saw the need for a team of specialists that understand the unique risks and circumstances of people with rheumatoid arthritis, so we created this special clinic just for those patients,” explains Mayo Clinic cardiologist Rekha Mankad, M.D., who directs the Cardio-Rheumatology Clinic in Rochester. Dr. Gabriel concurs. “Because they don’t necessarily show cardiovascular symptoms the same way as other people, and because they take medication that other people aren’t on and have poorer outcomes when they develop heart disease, they need more specialized care,” she says. The Cardio-Rheumatology Clinic enables early referral of patients with rheumatic diseases to cardiology. Patients have both a traditional cardiovascular risk assessment and a vascular health assessment. The results help create an individualized plan to manage risks and symptoms. Regular follow-up visits monitor the effect of different treatment and prevention strategies on patients’ cardiovascular health. Dr. Mankad and her colleagues track this outcome information in a new database. Dr. Mankad notes that cardiovascular treatment guidelines don’t exist for rheumatic conditions. Other conditions that carry an increased cardiovascular risk, such as diabetes, do have guidelines for target lipid levels, blood pressure and weight. The Cardio-Rheumatology Clinic’s innovative practice gives physicians and patients the information they need to more accurately assess cardiovascular risk and to intervene much earlier. It paves the way for better management of heart disease and improved quality of life for people with rheumatic diseases.